Think of it as protection for you watch! A real steal. 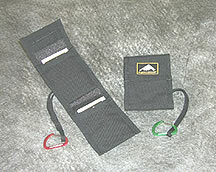 1 inch tubular nylon webbing provides greater comfort and less stink. The Rock Band's unique design is the hook and loop equivalent of a locking carabineer. The band won't come undone and prevents loss in the event of watch pin failure! Price discount for a 6-pack provides a cost effective means by which you can change colors with your mood-or get a few gifts for friends. This multi-purpose 2 pocket flip case can carry medical latex gloves for Paramedics, or can be used by anyone for carrying business or i.d. cards. Wire-gate biner leash to prevent lose. This all purpose pack/belt leash offers incredible versatility for affixing keys and other valuables that need to be accessible. A tremendous range of uses. Two piece design allows you to separate your house keys from you car keys. Perfect for when you need to warm up the car, but still need to lock up the house. Available in 6 color combos. Printed on Gildan® heavy weight cotton. These high quality mini-biners incorporate the spring into the gate design which virtually eliminates the possibility of spring failure. These leashes come standard with several of our Pack Accessories but you may want more to secure other items. Note: Standard leash length is approximately 6 in. Please be sure to specify additional length in the special notes section during checkout if a longer leash is desired. Copyright © 2001 [Right Stuff]. All rights reserved.